N7ML's awesome 40m 3/3/3 array, Mike's 6 high stack of C3s is barely in the background. 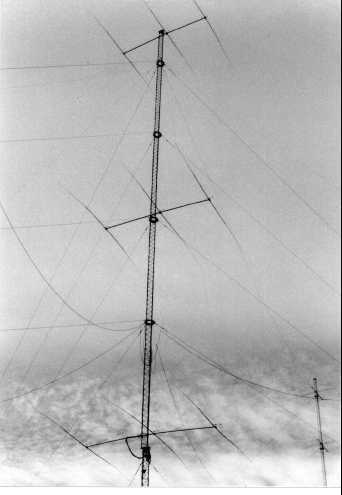 The 40m tower is 190ft tall, and the 6 high C3 antennas stack tower is 180 feet tall. Both are rotating towers. Mike uses a StackMatches to feed both arrays. Array Solutions custom built for him 2:1 mini StackMatches to stack the C3s as a top pair, middle pair, and lower pair. Each pair is connected to a two port Mini StackMatch and these three Mini StackMatches are controlled by a three port StackMatch.